Dr. Birgit Boss works with Robert Bosch GmbH in different business areas and sectors in an international setting since 1996. She is a Software Engineer and Lead Software Architect with more than 20 years experience in the development and roll out of architectures, methods and standards for complex (embedded) systems. Areas of expertise include Software Architecture, Software Product Line Development, Software Ecosystems, Continuous Refactoring, Process Development and AUTOSAR. Her current interest is on Industrial IoT, semantic technologies and digital twin concepts (including the asset administration shell). 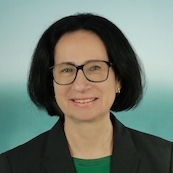 Dr. Birgit Boss is active in various standardization committees and activities in the context of industry 4.0, the AG1 “Reference Architectures, Standards and Norms” of the German Plattform Industrie 4.0, Industrial Internet Consortium (IIC), ZVEI Work Group “Models and Standards”, eCl@ss Digitalization Expert Group and others. She is convinced that standardization is a key factor for interoperability. Dr. Birgit Boss studied computer science at the TH Darmstadt, Germany. She worked as a research engineer at the Forschungszentrum Informatik (FZI) and received the PH.D. degree from the Karlsruhe University, Germany, in 1995.